As is often the case for us dog lovers, getting my puppy came out of sadness and loss. 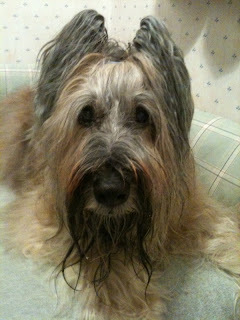 On May 3, 2011, my tawny briard, Mimi, left me. She was 20 days short of 14 years old. Her death, due to her age and health conditions, was not unexpected -- each day was a life and death struggle -- but I was hoping she would make it to her birthday, May 23. She just couldn't do it. I had good friends, local and long distance, and family who helped me get through this terrible loss. And I went to a pet bereavement group, lit a candle for her, read websites about pet loss, and used my knowledge of psychology to help myself as best I could. But I continued to be very depressed. Antidepressants couldn't lift it. I found a briard listserv and joined. I read many of the archived posts from people who love briards, and I was comforted. 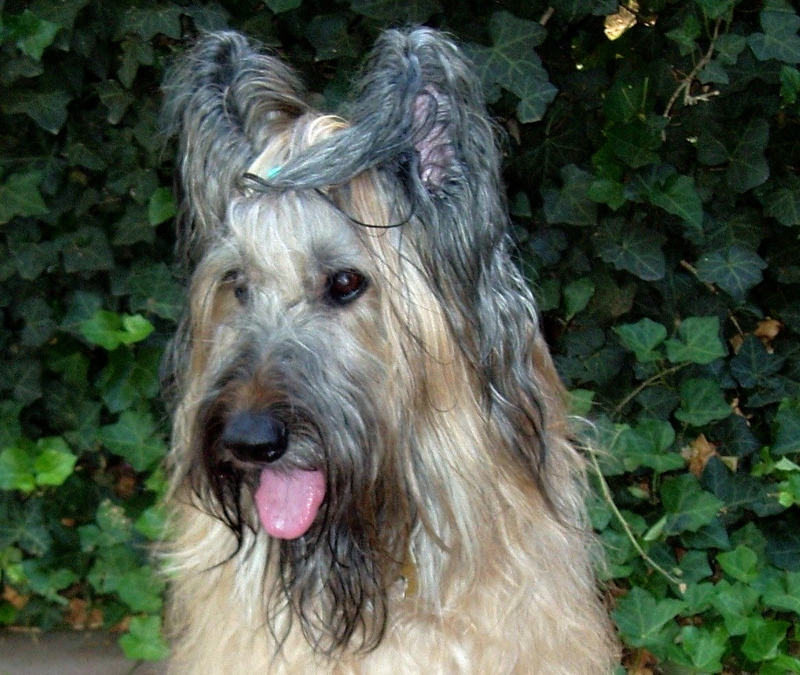 I especially appreciated the threads about memories of their "first briard." So I went on the list and introduced myself, and Mimi, my first briard and only. And I sent them my last photo of her, just a week before she died, when she would not eat and could barely stand, but she was smiling! So sweet and smart. I am grateful she lived as long as she did; that was a good long life for this breed. But still, it's a very painful loss no matter when our dogs leave us. Her last 6 months were rough. She had developed laryngeal paralysis and had a panic attack at the vet hospital and couldn't breathe, couldn't be stabilized; she was rushed into tieback surgery and came home to me a few days later. I was lucky that the breathing failure happened at the vet hospital and 2 surgeons were standing by! But then came bouts of aspirational pneumonia and more hospitalizations, esophagus swallowing issues ... when Mimi was home, I watched her 24/7; without classes that semester, I focused on keeping Mimi alive. I had a medication schedule of 11 different medications for her at one point, and she had a regular vet, a dermatologist, an eye doctor, internist, physical therapist, and GI specialist. I had pet insurance and I can't stress enough how helpful that was! I could afford to do what she needed. Mimi had a will to live, always bouncing back, and smiling at me until the end. She had a way of making friends with everyone who knew her. Then suddenly, there were no more doctors, no emergency visits to the hospital at all hours, no medication schedule, no anxiety that she would die, no more vet expenses, no brushing or playing or walking or feeding or hugging. Everything ended and I felt unbearably lost. I missed my friend terribly.